(CN) – Sen. Susan Collins, R-Maine, announced Friday afternoon that she will vote in favor of Brett Kavanaugh on Saturday, all but assuring his confirmation as the next associate justice to the U.S. Supreme Court. “Nevertheless the four people that she named could not corroborate anything,” the senator said. 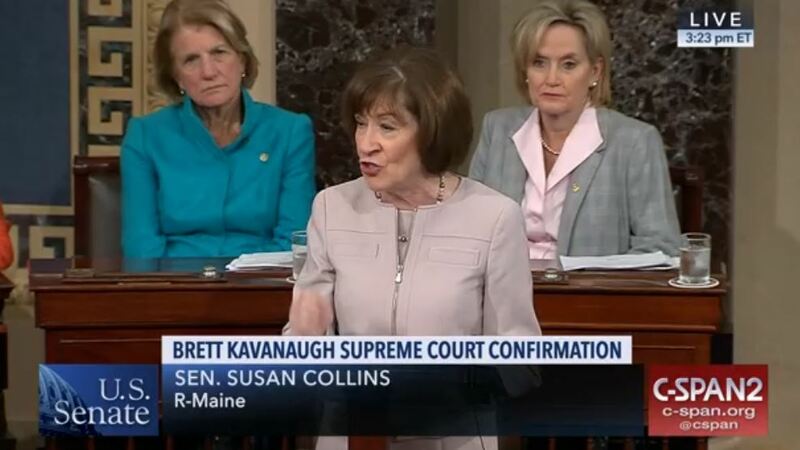 Beyond the sexual misconduct claims, Collins additionally explained she believes her role as a senator is to determine whether a president’s Supreme Court nominee is “within the mainstream” of judicial thought. She said she opposes “litmus tests” for nominees and that she does not subscribe to arguments that Kavanaugh would be a vote against the federal healthcare law or that he would give a free pass to President Donald Trump while serving on the court. A rare Republican supporter of abortion rights in the Senate, Collins said she was also satisfied enough with Kavanaugh’s answers about precedent to conclude he would not be a threat to Roe v. Wade if confirmed to the high court. “To my knowledge, Judge Kavanaugh is the first Supreme Court nominee to express the view that precedent is not merely a practice and tradition, but rooted in Article Three of our Constitution itself,” Collins said. Collins’ speech came shortly after Senator Jeff Flake, R-Ariz., said he plans to support Kavanaugh’s nomination on Saturday. Senator Joe Manchin, D-W.Va., announced shortly after Collins’ speech that he too would be voting to confirm. Barring any surprise defections, with Collins, Flake and Manchin on board, Kavanaugh will receive enough votes to take retired Justice Anthony Kennedy’s seat on the Supreme Court. Senator Lisa Murkowski, R-Alaska, was the one Republican to oppose Kavanaugh in a procedural vote on Friday. The confirmation vote on Kavanaugh’s nomination is expected to take place on Saturday.